It is a lovely Spring morning as we gather at Spring Plantation in Taverham to continue our clearing of the Rhododendron (Rhododendron ponticum) and Cherry Laurel (Prunus laurocerasus) that is found onsite. Luckily, we have a few more people today and we are all keen to start cutting down the large stands and allow more light into this part of the woods. 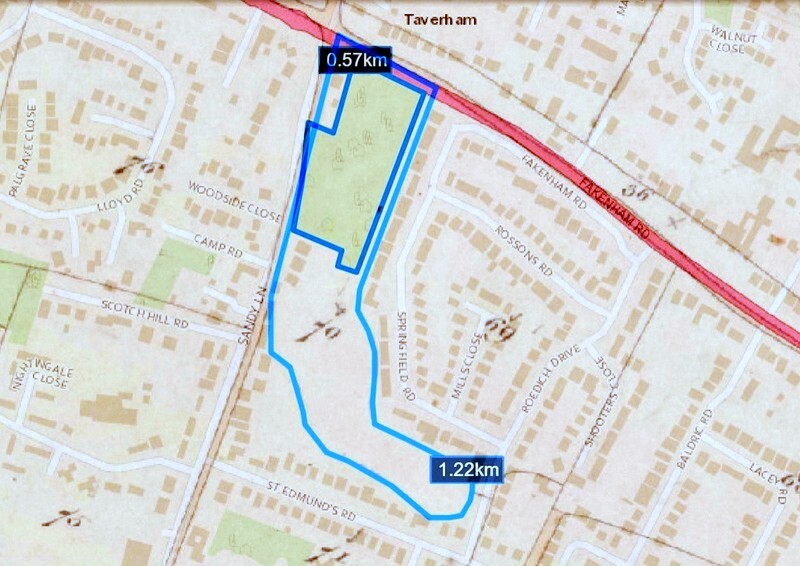 The light blue outline is the original size of the Spring Plantation back in 1840 and the dark blue outline depicts the size of the site today (images courtesy of Norfolk County Council). Looking back at some of the old Norfolk maps and aerial photos of the Plantation, the location was originally a lot larger (approx. area of 0.04 sq km in 1840) but today, it has been reduced to a quarter of its original size. This is probably due to the clearance of the land as part of the war effort in WWII and the expansion of residential housing in Taverham which can be clearly seen in the 1946 and 1988 aerial photos (see the Norfolk Historic Maps website). Today, the remaining portion of the woodland consists of a variety of established broadleaf and deciduous trees, surrounded by residential buildings. Cutting of the plants using hand saws and chainsaw and dragging the brash to the fire for burning. By morning tea, we had created a huge pile of brash for burning, so it was an excellent time for a cuppa and a piece of Roberts low calorie Banana and Ginger cake while we listened to the snap, crackle and pop of the burning brash when it was thrown onto the fire. The bigger branches that could not be cut by our handsaws were chain-sawed and the remaining stumps painted with herbicide to minimise any regrowth. 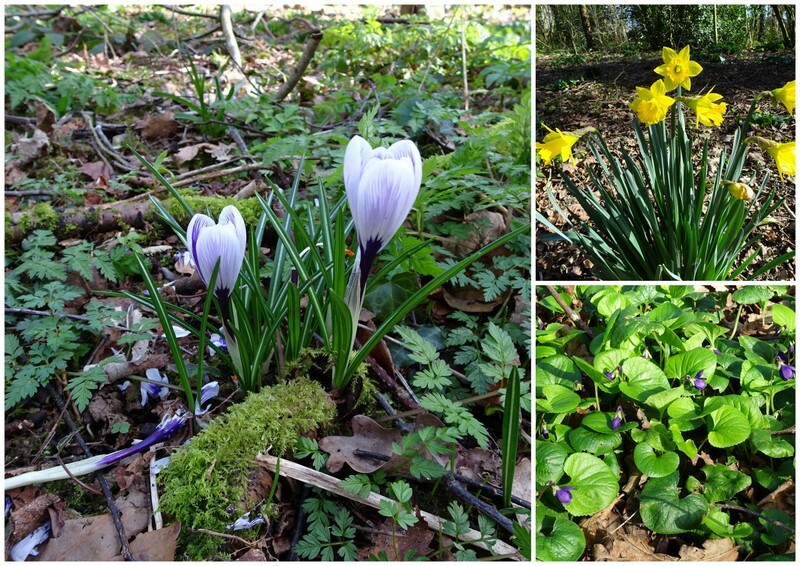 Some early flowering plants found on the day, Crocus sp., Daffodils sp. and Sweet violets (Viola odorata). 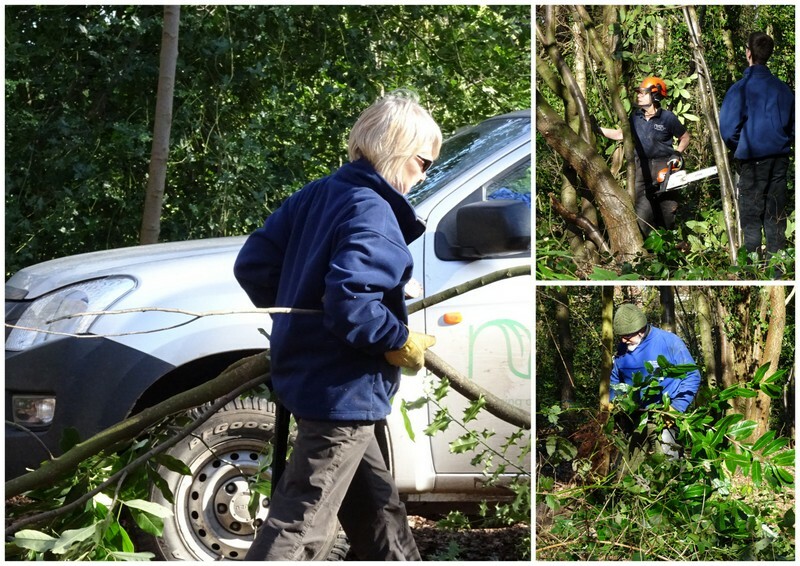 At the end of the day we had cleared a large section of the invasive plants from the top part of the site where previously they had overshadowed the pathways and hidden from view some native trees (e.g. Silver Birch, Hazel). As a last reminder of the potential of this site, we noticed large areas of Bluebells coming through, so it might be a great place to visit next month when they should be ready to bloom.